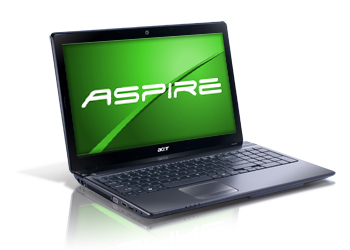 Acer Aspire 5750Z (AS5750Z-4882) comes with 15.6-inch WXGA Acer CineCrystal display with LED backlight technology. The display has 16:9 aspect ratio and integrated Intel HD graphics. This laptop computer is powered by Intel Pentium B950 dual-core processor, which clocked at 2.10 GHz and has 2 MB cache. Acer Aspire 5570Z (AS5750Z-4882) is equipped with Intel HM65 Express chipset, 4 GB DDR3 memory, 500 GB Serial ATA 5400 rpm hard drive, and optical drive. For audio, this laptop is equipped with 2 built in stereo speakers and also supports HD audio. The card reader supports Memory Stick PRO, MultiMediaCard, Secure Digital card, and xD-Picture card. Other features available on this laptop are 6cell Lithium-Ion 4400 mAh battery, camera, Gigabit Ethernet LAN, 802.11 b/g/n wireless LAN, multi-gesture touchpad, keyboard, three USB 2.0 ports, HDMI port, and VGA port.